Durham County Council was established along with all the other English county councils in 1888. Major local government reorganisation on 1 April 1974 created the metropolitan boroughs of Sunderland, South Tyneside and Gateshead out of County Durham into the newly established metropolitan county of Tyne and Wear. At the same time, the new non-metropolitan county of Cleveland took out Stockton-on-Tees and Hartlepool. County Durham did however gain the rural district of Startforth south of the River Tees near to Barnard Castle. Since then, Cleveland has been abolished, but Stockton-on-Tees and Hartlepool have not been returned to Durham, except for the purposes of Lord-Lieutanancy. County Durham borders on the ceremonial counties of North Yorkshire, Cumbria, Northumberland and Tyne and Wear. On 1 April 1997, the borough of Darlington with its population of 100,000 became a unitary authority and thus administratively separate from County Durham. It continues to share the police and fire services with the areas under County Council control. 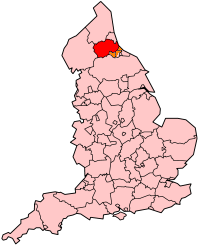 On 4 November 2004 a referendum was held on proposals to introduce an elected regional assembly for the North East of England. At the same time as this, the electorate was asked to choose between two options for the organisation of local government below the regional tier. The assembly proposal was rejected overwhelmingly, making the question of unitary authorities in County Durham moot.